Mark Goodman is a results-driven executive with experience in global brand development, building and rebuilding brand operations within consumer-driven retail, food and financial service industries. He has held significant leadership positions, including key roles at Fortune 1 and 50 companies: Walmart/Sam’s Club (EVP, Chief Marketing Officer) and McDonald’s (Corp. VP, U.S. Brand & Strategy). Mr. Goodman currently serves as the Global Chief Marketing Officer for Vistage Worldwide, Inc. the world’s largest CEO membership organization. In addition, Mr. Goodman serves as Chairman of the Colorado Nut Holding Company and on the board of directors for Pinnacol Assurance Insurance Company and Bellco Credit Union. He also serves on the board of trustees at Xavier University of Louisiana where he chairs the Development Committee. Mr. Goodman is passionate about the role of higher education in helping people from all walks of life become successful in their chosen field of interest. Mr. Goodman has been active in supporting educational institutions on a national basis over the last several years. 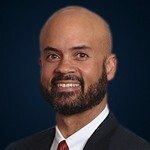 He has served on the board of directors for St. Louis University School of Business, St. Louis, Missouri, Livingstone College Salisbury, North Carolina, History Makers, Chicago, Illinois, Eton Academy, Birmingham, Michigan, Cal State Dominquez Hills School of Business. Mr. Goodman has served as a member of the Tufts University School of Arts & Sciences Board of Advisors since 2012 and its Campaign Committee. He holds a master’s degrees in philosophy and logic from Tufts University and a bachelor’s degree from the College of Wooster. Mr. Goodman and his family reside in Denver Colorado. He was elected to the Board of Trustees on November 4, 2017.